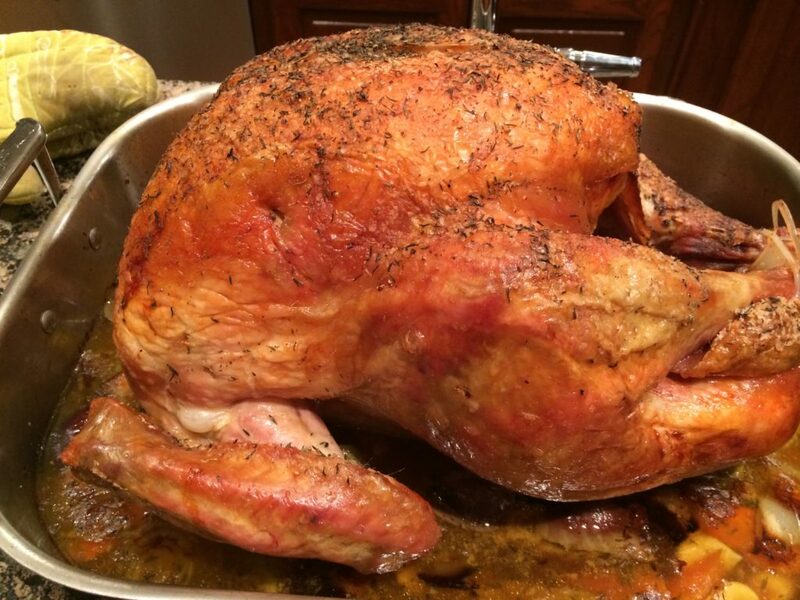 Roasted Turkey fresh from the oven! It’s a bit dreary here at home today. It’s raining; the temperatures are finally a tad cooler, though not as low as I’d prefer. However, it is closer to boot-wearing weather than sandal-wearing weather so you won’t hear me complain (too much!). We have been traveling a lot the past few weeks. It was a refreshing change of pace to spend time in two of my favorite cities: Washington DC and New York City (seriously, who doesn’t love NY??). We also fit in a visit with our son at college and attended a family wedding in the hills of PA. Yes, definitely a busy month, but well worth it. And what a time to be back in the Northeast! The leaves were brilliant this year – their oranges and yellows and reds popped! We spent much of our time driving through their colorful symphony, and I happily absorbed every second of it! Truly. Mesmerizing. The wedding was blessed with a somewhat balmy day for October, and the ceremony was able to be held outside, its backdrop being the myriad colors present all around us. Beautiful. Somehow in all that travel October managed to slip by, tip-toeing past so I wouldn’t notice. My writing slowed quite a bit last month. But November has now stealthily crept in, bringing with it an extra hour (yahoo!) and, soon, my favorite day of the year: Thanksgiving. As you all probably have gathered by now, Thanksgiving is my favorite holiday. It is all about spending time with your loved ones, enjoying good food, and enjoying each other’s company. Or at least that is what it means to me. My boys are coming home and we will have others joining us for the big feast as well. This is my happy place. I am already elbow deep into my preparations. The turkey is one of the first things I take care of in November. In past years I ordered my turkeys from a local grocer. They have been nice turkeys, but I really wanted to buy fresh, pastured turkeys, ones raised locally. This year I finally found my source! Just yesterday I placed an order for an 18+lb turkey from Bois d’Arc Meat Company. I first discovered them at their booth at the Dallas Farmers Market. I gathered some literature while there, then set about to do my research. While they are not super close (about a 2.5 hour drive from me according the the all-knowing Google Maps), they are still in TX. A farm visit at some point in the future would be doable. So I am going to count that as ‘local’. I worried I had waited too long to order a pastured turkey. In doing my research I noted that several other places had already filled their quota of pre-orders for this year’s feast. Fortunately, Bois d’Arc still had turkeys available. So I ordered my turkey…that box now has a huge check mark…Yay, me! So now it’s on to other to-do items. I will buy my non-perishable groceries, make stock (both vegetarian and turkey), make my pie crust dough, and bake more breads. I had big plans to make my pie crust dough and place it in the freezer this past week, as well as baking my Sweet Potato Dried Cherry Rolls; however, Life (with a capital L) happened. I got a little under the weather after all that travel. But I am better now. Time to get caught up! In the coming days I will keep you updated on my other preparations and progress for the Big Day. Love reading about your Thanksgiving Preparation! It’s a holiday in and of itself!